Along with the African American Planning Commission, Inc., Brisa Builders, and Lemle & Wolf; Think! designed a compelling building to serve and improve the Brownsville, Brooklyn community. The project is expected to create approximately 233 apartments serving the formerly homeless, senior families, and families in need of supportive housing. The B’Ville Hub is a two story element comprising of commercial spaces supporting local businesses and entrepreneurial endeavors. Our client for this project, Community Access, is a highly regarded not-for-profit developer focusing on affordable and supportive housing for people with mental health concerns. This project integrates the affordable and supportive housing residents within a single residential community. The project consists of 215 apartments within a 170,000 square foot project with ample community spaces and facilities to support mental health programs. The Betances Houses comprise a “scattered site” New York City Housing Authority development in the Mott Haven section of the Bronx. Under their NextGen program NYCHA is developing open areas within the Betances complex for new development by independent affordable housing developers. Betances VI is to be developed as a 15 story, 101,000 square foot building with 115 affordable residential units, 25 of which are intended for formerly homeless families. Located in the recently gentrifying Bushwick neighborhood of Brooklyn, the conversion of 785 Hart Street makes use of the “grandfathered” industrial use of an existing one story brick garage to create a mixed-use project by adding two duplex residential units above. Ample roof decks are made more private by the use of architectural screen walls and an industrial aesthetic has been developed to create a product well-tuned to the Bushwick market. This project is comprised of two seven story rental residential buildings with a total of 48 units, mixing studio, one and two bedroom units and three bedroom duplex apartments. Built next to an active church, the design attempts to find a modern architectural language sympathetic to the historic structure between residential blocks. Outreach is a not-for-profit organization providing inpatient and outpatient substance abuse treatment programs in the Richmond Hill neighborhood of Queens. The think! design for this 15,000 square foot building will provide residential treatment programs for 26 women, including women with children. The project was funded through the New York State Office of Substance Abuse Services [OASAS] with project management provided by the Dormitory Authority of State of New York [DASNY]. The Long Island City district of Queens is a neighborhood bustling with new hotel construction. think! was tasked by our client to create a distinctive design that would stand out from this pack of budget hotels and establish itself as a unique destination. This Marriott branded hotel consists of 110 guest rooms within a new 70,000 square foot structure. Twin townhouses located on a quiet street in the Clinton Hill section of Brooklyn. These houses are single family residences with a variety of spaces including: two story living rooms, light filled family rooms and four bedrooms. 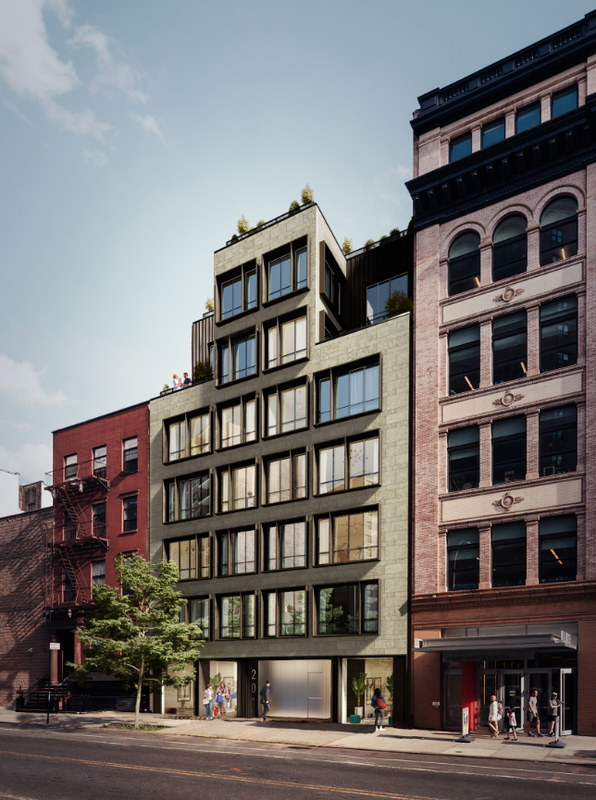 This project is the first of three projects on the Lower East Side of Manhattan for a client committed to modular construction. Designed as condominiums at the mid-range of the Manhattan luxury market, the building is comprised of five floor-through units and ground floor retail. This project is the second of three projects on the Lower East Side of Manhattan for a client committed to modular construction. Designed as condominiums at the mid-range of the Manhattan luxury market, the building is comprised of eight floor-through units, two full floor penthouses and ground floor retail. This condominium building, targeted to the high end of the residential market, is being built on an irregular lot in the Chelsea neighborhood of Manhattan. The ten floor-through two bedroom units have been designed to a high level of interior finish with amenities such as millwork closets, home offices and individual rooftop terraces. This luxury 28 story condominium building is being built on an extremely narrow site in the Brooklyn Heights neighborhood. 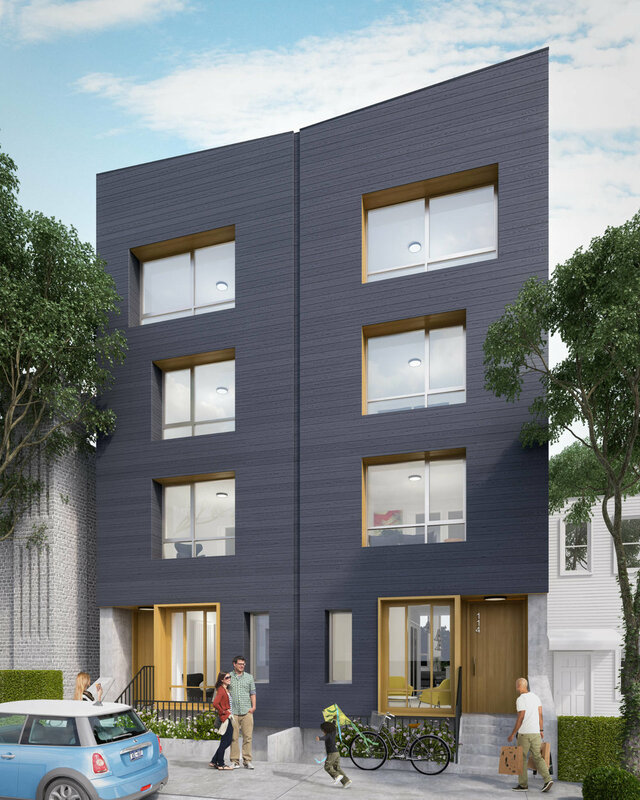 The project features three bedroom floor-through units in its lower section and four bedroom duplex units on its upper floors.